I’d gone to Birmingham’s Town Hall ostensibly to review a concert by the Cuban pianist Roberto Fonseca and his Cuban/African band*. I’d already been listening to his new album “Yo” (review here: http://worldmusic.co.uk/roberto_fonseca_yo_album_revie) and knew I was going to be in for a great concert by the headline act. What I wasn’t expecting was to be blown away by the support act! 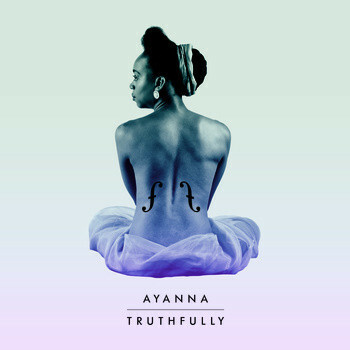 Ayanna is a composer, cellist and singer garnering some serious critical praise and stirring up musically minded people on both sides of the Pond (she recently won the Amateur Night at the Apollo Theater in Harlem, New York - the first non-American ever to do so). Ayanna (Witter-Johnson) is a young British woman sometimes credited as a pioneer of Black Folk Music. She’s worked with some great names already (Courtney Pine, Kronos Quartet, LSO, etc) and has just released an EP entitled “Truthfully”. Sadly I had to wait until after her first number before I could enter the auditorium (why didn’t anyone tell me Cambridge St was blocked off? ), but slipped into the back of Birmingham’s beautiful Town Hall to see this small vision in white holding court centre stage and already entrancing the audience. I lost 2-3 numbers whilst I was taking photos, but then settled down to really listen. And wow! What a find. 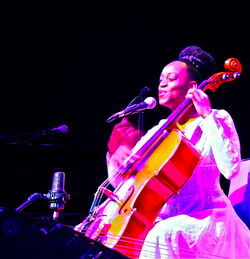 Ayanna's music is indefinable. It seems to draw simultaneously on many traditions (soul, jazz, folk, classical, latin, balladry, rock, spirituals, to name but a paltry few) but is all blended down, like an elegant cocktail, into something quite distinctive and very, very tasty. As I sat down and put away the camera Ayanna set up a fascinating groove and then out of nowhere dived into a fabulous version of "Roxanne"! Really wasn’t expecting that. It was based rhythmically on a bolero and showcased her great technique on the cello - especially the rasping, bounced and dragged bowed sections, alternated with the sensitive use of tapped fingertips on the body of the cello to provide percussive stippling. It struck me that she uses her cello like a flamenco guitarist does, effortlessly flowing between plucking, strumming, bowing and beating out rhythms without any pause or delay, in a river of sound, a very sophisticated one-(wo)man band. And then there was her voice… again, Wow. Rich, varied, elastic, expressive, passionate and yet perfectly under control. In fact, you get so stunned by her flawless technique, control and inventiveness on the cello that you almost forget just how incredible her voice is and how beautiful the songs are. If she had just one of these skills, she’d be good - but both (and at the same time), well, that’s something to see and hear. Many cellists have an affinity with their instrument and can be seen, bowed over it, lovingly stroking and coaxing out the resinous honeyed sound; but Ayanna seems to go one further than this - the cello just seems an extension of her whole body. She’s totally at one with her cello and voice. In the words of Steve Tyler: “It’s a beautiful thing, baby!”. This mastery of tone and technique even went right down to the dainty right foot beating out a 2:3 clave de son rhythm on her mounted cowbell (great dynamics, by the way, on what is quite an unforgiving instrument) on “Unconditionally” - a song to her mum. Ayanna moved onto the piano for the final number entitled “Truthfully”. If you get the chance, check her out. Very impressive. And that white dress? Lovely.